The loathing that led an Iraqi to hurl shoes at Bush serves as the world's final verdict on US folly in Iraq. It's also a caution for Obama as he ponders Afghanistan. Bush ducks to avoid a shoe hurled by an Iraqi journalist. They hate us for our shoes. Somewhere in what passes for the deeper regions of President Bush’s mind might come that reassuring giggle of a thought as he once again rationalizes away Iraqi ingratitude for the benevolence he has bestowed upon them. Ever at peace with himself, despite many obvious reasons not to be, Bush quipped, “I didn’t know what the guy said but I saw his sole.” But the lame jokes no longer work. 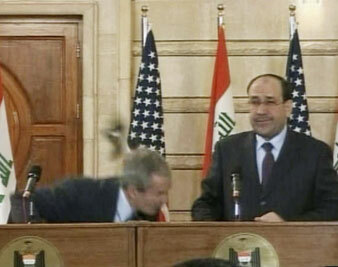 The shoe-throwing Iraqi journalist is now a venerated celebrity throughout the Mideast, and his words to the president–“this is the farewell kiss, you dog”–will stand as the enduring epitaph in the region on Bush’s folly, which is the reality of his claimed legacy of success in the war on terror. That and the Iraqi’s devastating follow-up as he threw his second shoe, “This is from the widows, the orphans and those who were killed in Iraq,” a reminder that we have used much deadlier force than a shoe in the shock-and-awe invasion once celebrated in the American media as a means of building respect for democracy. No wonder then that we are perceived as blundering bullies by so many in the region that we claimed to be interested in modernizing. That an Iraqi journalist, whose family had been victimized by Saddam Hussein and who was kidnapped by insurgents while attempting to work as a TV reporter, came to so loathe the American president, as does much of the world, should serve as the final grade on the Bush administration. It should also serve as a caution to President-elect Barack Obama as he seeks to triangulate withdrawal from Iraq with an escalation of the far more treacherous attempt to conquer Afghanistan. In the end, it does not matter that our claimed intentions appear noble if our practice on the ground adds up to a mélange of brutal incompetence. It is significant that increased troop deployment to Afghanistan was recently announced by Secretary of Defense Robert Gates, who will hold that same post in the new administration. This is the same Gates who in his 1996 memoir details how, as a member of the Carter administration, he was involved in supporting the mujahedeen Islamic fighters against the secular government in Kabul six months before the Soviet invasion. These foreign adventures always start out so wonderfully: We will be greeted as liberators, democracy will flourish, the West will be safer, and instead we end up ever more scorned. The media traveling with Bush reported it as a victory of sorts that no reporters in Kabul threw shoes at our president during his press conference there. So much for lowered expectations.